The Nymphaeum Traiani in Ephesus has long been considered as one of the early examples of public fountain architecture in Roman Asia Minor that features a monumental aedicular façade. Discovered by the former excavation director Franz Miltner in 1957, this building is prominently located in the middle section of the Curetes Street in the city center. The present study represents the first detailed analysis of this structure, and with this new study, architectural questions and peculiarities posed by the earlier schematic reconstruction have now been resolved. The importance of the Nymphaeum Traiani lies not in its function as a fountain. It rather represents a celebration of its benefactors Ti. Claudius Aristion and Iulia Lydia Laterane. The architectural form of this structure, especially its aedicular façade, is hardly necessary or suited for the withdrawal of drinking water. Instead, its architectural form provides an excellent venue for the purpose of self-representation of the Roman elite in Asia Minor. 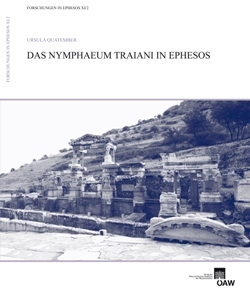 In short, the Nymphaeum Traiani is a monument that can be seen as a dedication to the honor of its donors and their contribution to the city of Ephesus as well as their ties to the Roman emperor. Printed with the support of the Austrian Science Fund (FWF).